"Don't just imagine yourself as a hero, be one in real life." Universal has debuted the third official trailer for the new Robert Zemeckis movie, titled Welcome to Marwen, starring Steve Carell as a man who finds solace in WWII miniatures that he photographs. Opening in theaters in just a few more weeks. This is a true story, and many have seen the documentary about Mark Hogancamp already - which is getting a fresh release to coincide with this movie's opening. Carell plays Mark, the victim of a vicious attack who finds a unique and beautiful therapeutic outlet to help him through his recovery process. The film's cast includes Leslie Mann, Diane Kruger, Merritt Wever, Janelle Monáe, Eiza González, Leslie Zemeckis, Gwendolyn Christie, and Neil Jackson. The trailers for this movie haven't been that great, they're just a bit too sentimental and the movie looks so cheesy I'm not really sure if it's going to be any good. Take a look. You can still watch the first trailer for Zemeckis' Welcome to Marwen here, and the second trailer here. Welcome to Marwen tells the miraculous true story of one broken man's fight as he discovers how artistic imagination can restore the human spirit. When a devastating attack shatters Mark Hogancamp (Carell) and wipes away all memories, no one expected recovery. Putting together pieces from his old and new life, Mark meticulously creates a wondrous town where he can heal and be heroic. As he builds an astonishing art installation—a testament to the most powerful women he knows—through his fantasy world, he draws strength to triumph in the real one. 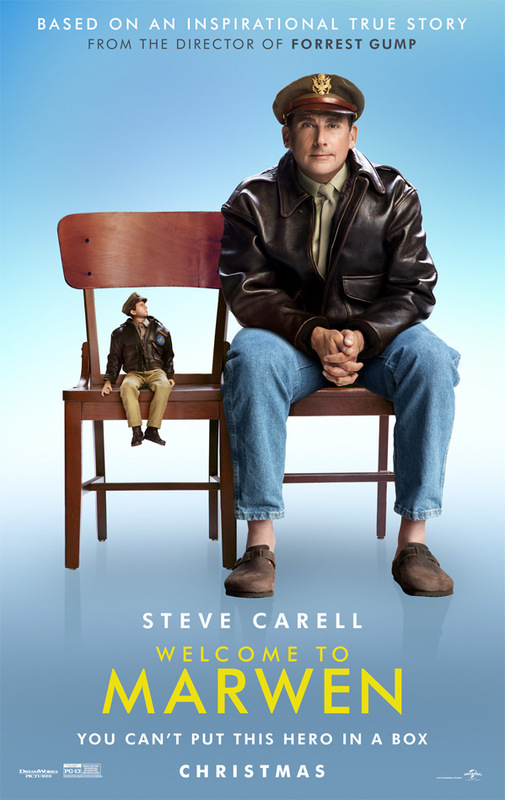 Welcome to Marwen is directed by iconic American filmmaker Robert Zemeckis, director of many films including Back to the Future, Who Framed Roger Rabbit, Contact, Cast Away, Forrest Gump, The Polar Express, Beowulf, Flight, The Walk, and Allied. The screenplay is written by Caroline Thompson and Robert Zemeckis, based on the true story of Mark Hogancamp. Universal will release Zemeckis' Welcome to Marwen in theaters starting December 21st this fall. Who wants to watch?